Science, 2017, 9(420), doi: 10.1126/scitranslmed.aal3765. PF-562271 purchased from Selleck. (F,G) The migration and invasion ability of 5637 and T24 cells transfected with PF-562271 and WT-METTL13 was examined. The number of cells was quantified and is shown in a column graph. Sci Rep, 2016, 6:19261. PF-562271 purchased from Selleck. D-F. T47D cells plated as in A were treated with vehicle (−) or the FAK Y397 inhibitor, PF-562271 (+), for 1 h prior to ± PRL (4 nM) for 15 min (representative immunoblots). Oncotarget, 2016, 7(30):48093-48106. PF-562271 purchased from Selleck. Acta Pharmacol Sin, 2018, doi:10.1038/aps.2017.189. PF-562271 purchased from Selleck. 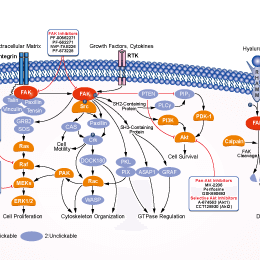 VEGF and P450 enzyme production in response to FAK or Src inhibitors. MCF10A cells were cultured in LD collagen gels ?vehicle control (V), 10 uM PF-562271 FAK ATP inhibitor (PF) or Src inhibitor PP2 for 24 h. Cells were also lysed and examined for CYP1A1 or CYP4B1 by immunoblot (B and C) and densitometry (D and E). VEGF data are displayed as the mean normalized to the vehicle control, N = 6, 盨EM, *p < 0.003 vs control (A). P450 data are displayed as the mean relative to GAPDH and normalized to the control. N > 4, ±SEM, *p < 0.05 vs respective control (D and E). Environ Toxicol Pharmacol 2014 39(1), 114-124. PF-562271 purchased from Selleck. OVISE cells were incubated for 24 hr at the indicated concentrations of the FAK inhibitors. 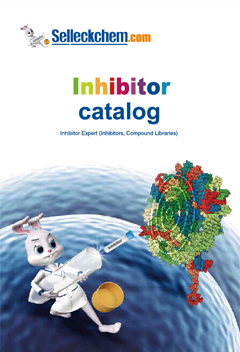 Immunoblots were performed to assess inhibition of auto-phosphorylation by the FAK inhibitors. PLoS One 2014 9(2), e88587. PF-562271 purchased from Selleck. Animal Models: Athymic female mice bearing BxPc3 or PC3-M xenografts. Roberts WG, et al. Cancer Res, 2008, 68(6), 1935-1944. Lim ST, et al. Cell Cycle, 2008, 7(15), 2306-2314. Canel M, et al. Cancer Res, 2010, 70(22), 9413-9422. Sun H, et al. Cancer Biol Ther, 2010, 10(1), 38-43. Bagi CM, et al. Cancer, 2008, 112(10), 2313-2321.